With their distinctive tartan, hordes of screaming female fans and singalong choruses, they were one of the biggest-selling groups of the 1970s, dominating the British charts for almost two years before rapidly fading back into obscurity. 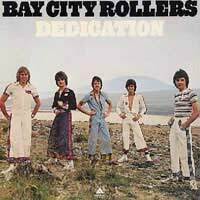 They were the Bay City Rollers and provided one of the pop phenomena of the decade. They might have seemed like a product of the 1970s, but they'd actually been around since 1967, starting life in Edinburgh as the Saxons (the Bay City came later, the result of sticking a dart in a map of the U.S.). For the first few years they just played locally until someone from a record label saw them gigging in a club and signed them. Even then it wasn't immediate fame. There was a 1971 hit, which took them on Top of the Pops, but they couldn't repeat it and from 1971-1974 they laboured away in frustration as single after single flopped. The big break came in 1974 with Remember (Sha La La). To many it seemed a mindless little song, but it took them back into the charts - all the way to number two, in fact. By now they'd developed a highly distinctive visual image which included plenty of tartan, including too-short trousers with tartan cuffs, scarves and short hair, a toned-down version of the skinhead look. As their string of hits continued with Shang-A-Lang and Summerlove Sensation, it proved to be a look copied by thousands of girls across the country as "Rollermania" exploded. Within a year they'd rocketed to become one of the country's top acts. But their timing was good; glam was fading and the pop market needed something to replace it and keep sales high. A tour saw them mobbed everywhere they went and they even had their own TV series. The fact that they were huge was underlined by the sales of the Bye Bye Baby single - more than a million copies, a feat that had rarely been achieved. Being top at home was one thing, but for any group, America was always the country to be conquered. Since the Beatles few British pop acts had managed to make any impact there, but the Rollers - or at least their managers - had ambitions to break America. The question was whether their very Scottish teeny-bop image could translate into that market. At first it seemed very possible, as Saturday Night went all the way to the top of the Billboard chart, a huge first step. Unfortunately it was one they couldn't repeat. In spite of two more hits, they could never completely crack the American market, although it wasn't for want of trying. In focussing on America, they took their eye off the ball at home. They were ignoring their fans and in the fickle world of pop, that didn't go down well. Additionally, with the rise of punk and disco, another great musical shift was beginning to happen, which wouldn't help their clean-cut cause. 1976 brought their last U.K. hit and Rollermania faded rapidly. By 1979 the group had tried to shed its image, becoming just the Rollers, but it didn't bring a change in their fortunes. There was a short-lived revival around the Millennium, but as with most pop music, it was fleeting.